Seeking out fresh, healthy, seasonal produce in the middle of winter can be a challenge – and salad ingredients are particularly hard to come by. As an alternative to lettuce, tomatoes, cucumber and other salad vegetables, why not give pea shoots a go? Pea shoots are packed with vitamin C, essential for immune system health and great in the fight against coughs and colds. They also contain amino acids, which boost protein levels in the body. They have a delicate, pea-like flavour and a crisp, juicy texture. Pea shoots can be bought in the supermarket – but if you enjoy this delicious, nutritious vegetable, you'll save money if you grow your own. 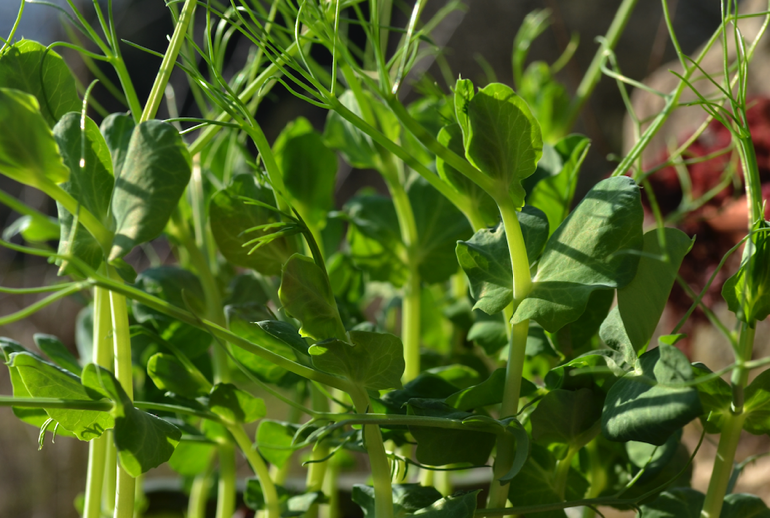 The good news is that pea shoots are extremely easy to grow at home – and are great fun for children to grow. Cauliflower is another tasty, healthy vegetable that's in season now. White cauliflowers are easy to find, but it's worth seeking out green and purple varieties too. Or try Romanesco cauliflowers, with their spectacular pointed florets and sweet flavour. Cauliflower can be bland and boring, especially if overcooked, so it's best teamed with strong flavours such as mackerel, curry spices or garlic. And strongly flavoured cheese – mature cheddar, stilton or parmesan, for example – is a perfect partner. For a classic cauliflower cheese, boil or steam cauliflower florets for 5-10 minutes – you want them to be tender, but not soggy. For the cheese sauce, melt 30g butter and stir in a rounded tablespoon of plain flour. Add 280ml milk, a little at a time, stirring well to remove any lumps. Bring to boiling point then immediately reduce the heat to the lowest possible setting. Cook for 5 minutes, then add a handful of grated mature cheddar. Stir until the cheese has melted, then add the cauliflower and mix gently until all the florets are coated with the sauce. Serve with pasta, or sausages and mashed potato. Cauliflower can also be eaten raw, along with carrots and other crudités to dip into houmous or guacamole, or roasted with olive oil and cumin seeds. To stir fry cauliflower, break the florets into small pieces and cook in a wok with garlic, spring onions, lime juice and soy sauce. Heat the oil in a large saucepan and fry the onion for 5 minutes until soft and golden. Add the garlic, chilli, ginger and spices and cook for a further 3 minutes. Cut the sweet potatoes into 2cm cubes, then add to the pan along with the cauliflower – stir well until all the vegetables are coated in the spices. Add the coconut milk and vegetable stock, then stir in the almonds. Bring to the boil, then reduce the heat and simmer very gently for about 25 minutes until the vegetables are tender. Serve with plain yoghurt, basmati rice and naan bread. To grow pea shoots, sow dried marrowfat peas into pots or trays of compost, water well, and place on a sunny windowsill. They can be sown at any time of year – even in January – and will be ready to harvest in just two or three weeks. Pea shoots are perfect served raw in a salad. Try combining with goats' cheese, fresh mint and olive oil, or smoked salmon, lemon juice and balsamic vinegar. You can stir fry pea shoots too. Heat some sesame oil, and add garlic and spring onions, pea shoots and mange tout. Serve with soy sauce and noodles. Or try gently wilting some pea shoots and combining with sundried tomatoes and shaved parmesan for a tasty pasta topping.